Interested in International Educational Opportunities or Preceptorships? 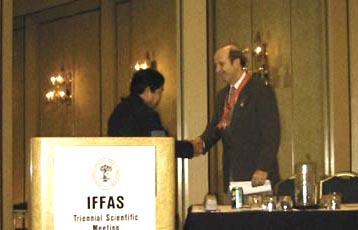 Yoshinori Takakura, M.D., Japan (left) passes on the office of President to Michael J. Coughlin, M.D., Boise, Idaho USA (right). Moderator Thomas O. Clanton, M.D., Houston, Texas USA, leads session on Total Ankle Replacement. Panelists include from left to right: Roger A. Mann, M.D., San Francisco, California USA; Charles Saltzman, M.D., Iowa City, Iowa USA; Hakon Kofoed, M.D., Copenhagen, Denmark; Harold Kitaoka, M.D., Rochester, Minnesota USA; Beat Hintermann, M.D., Basel, Switzerland; and Pascal Rippstein, M.D., Zurich, Switzerland. 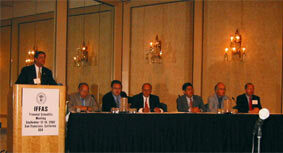 The IFFAS Council meet during the 2002 Triennial Meeting to deliberate on the future of the federation. 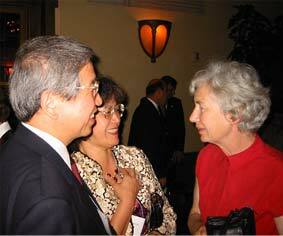 Suguru Inokuchi, M.D., IFFAS council member from Tokyo, Japan, and his wife Mie chat with Elizabeth Anderson, Glasgow, Scotland during the President's Dinner. 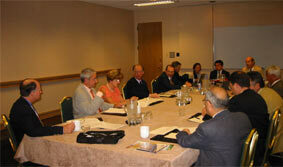 The IFFAS Council meets in San Francisco. Top row from left to right: Thomas Clanton, M.D. USA; Mauro Fuchs, M.D. BRAZIL; Caio Nery, M.D. BRAZIL; Greer Richardson, M.D. USA; Patrice Diebold, M.D. FRANCE; Michael Coughlin, M.D. USA; Zelman Simonovich, M.D. ARGENTINA; Paul Benamou, M.D. FRANCE; and Executive Director Richard Cantrall USA. Bottom row seated from left to right: Haruyasu Yamamoto, M.D. 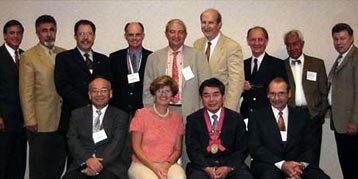 JAPAN; Greta Dereymaeker, M.D., BELGIUM; and Yoshinori Takakura, M.D. JAPAN; and Fernando Fonseca Filho, M.D., BRAZIL.